The declaration permits the IRS to postpone certain deadlines for taxpayers who reside or have a business in the disaster area. For more information, please contact us. 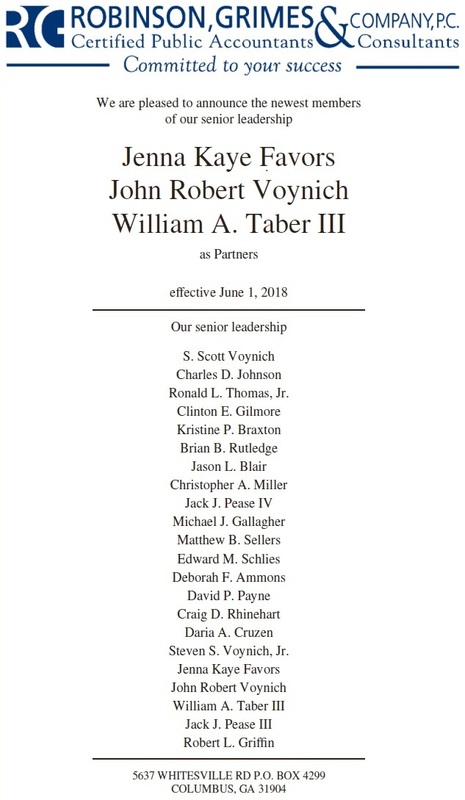 Senior leadership announcement from Robinson, Grimes & Company, P.C. House Bill 673 (also known as the “Hands Free Law”) was passed by the Georgia General Assembly and signed into law by Governor Nathan Deal. The Hands Free Law will take effect on July 1, 2018. A link to the complete law can be found here. The long and short of it: You’re not allowed to hold your phone while driving. You cannot have your phone in your hand or touching any part of your body at all (including in your pocket). A driver cannot have a phone in their hand or use any part of their body to support their phone. Drivers can only use their phones to make or receive phone calls by using speakerphone, earpiece, wireless headphone, or phone connected to vehicle or an electronic watch. GPS navigation devices are allowed. Am I be required to purchase a hands-free accessory, such as a mount or bracket? Stay safe (and don't get a ticket)! Identify the individuals who will lead implementation of the new standard. Attend training to understand the changes. Review net asset reporting to make sure classifications are correct. Discuss the changes with your audit or finance committee. Discuss the changes with your auditors related to audit timing and planning. Executing changes of this magnitude can seem daunting. Our NFP team is available to answer questions, help with general training, and provide resources for best practices in implementing the new standard. Equifax was hacked... what do I need to do? You've probably seen the new reports of the cyberattack on Equifax that may have compromised your personal information. Here is an article about it from USA Today. Note that the article mentions that you should not click links in any emails claiming to be updates from Equifax or connected to the breach. So what should you do? First of all, here is the Web site (the address is https://www.equifaxsecurity2017.com/) that Equifax has set up to inform you about the situation. It’s worth a few minutes of your time to read over the information on that page. The rest of this post simply describes what you can expect to do once you are on that Web site. Follow the instructions on that link – you’ll have to provide your last name and the last six digits of your SSN, then jump through some Captcha hoops to prove you aren’t a robot. It will then let you know if you are likely affected by the breach. If your information was likely affected you'll see a message like this one. 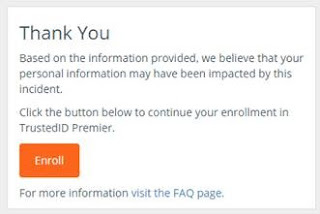 If you do then click the Enroll button (to enroll for free in Equifax's Trusted ID Premier program, which provides you 5 offerings - again, for free: credit reporting, 3-bureau credit file monitoring, credit report lock, social security monitoring, and identity theft insurance) and you'll then see a screen similar to this one, which will advise that you will have to check the indicated Web site at a later date to complete the enrollment process. 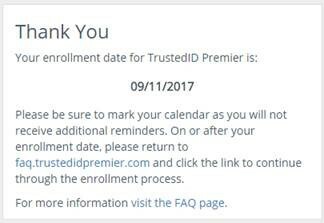 Note that because of the incident Equifax is offering one year of this program to anyone in the US - whether you were impacted by the breach or not.